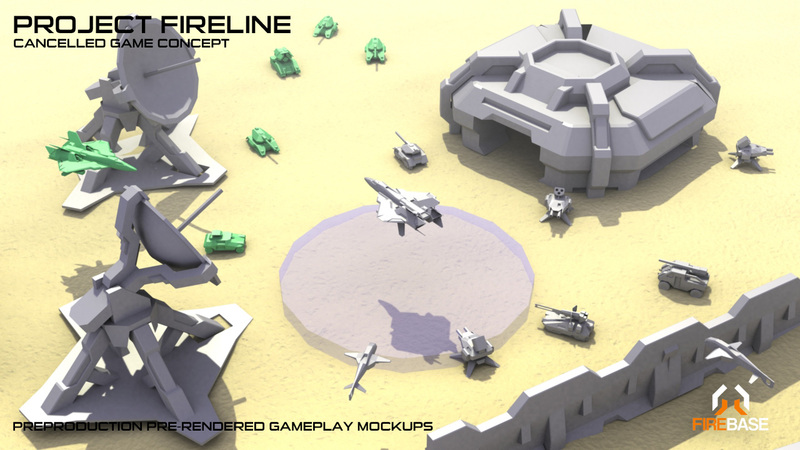 In July and August of 2011, while Orbitron: Revolution was entered into Dream Build Play and we were waiting for the results of the contest, Firebase started work on a new game. It was to be a project very similar to the Genesis classic, Herzog Zwei but with a few key differences. First of all, your VTOL jet was never intended to transform into a robot. In HZ the robot mode is used to attack ground forces and escape missile attack. Both things would have been done from the air as you could effectively shoot down what was incoming. Your jet would be fitted with a gatling gun and a very limited number of lock on missiles that needed to get replenished by being near a base. The units were to be changed up a bit. 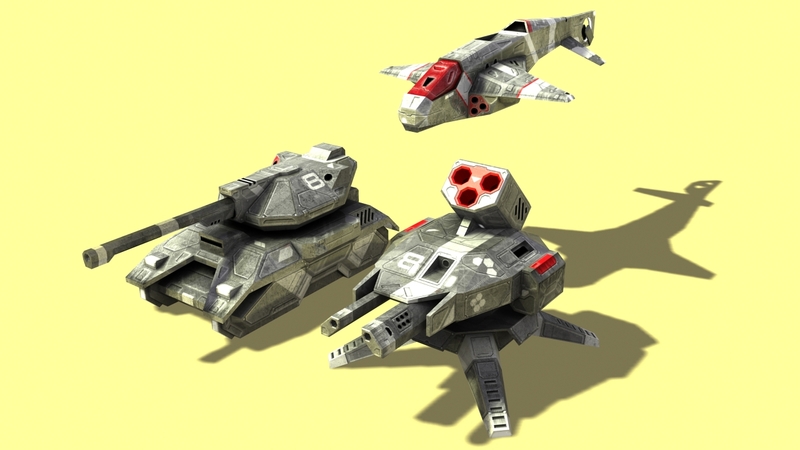 We were going to add hovering air units you could build, giving them the ability to traverse over canyons and water. Also, there were siege guns that could fire at range but were useless close up in their basic form. 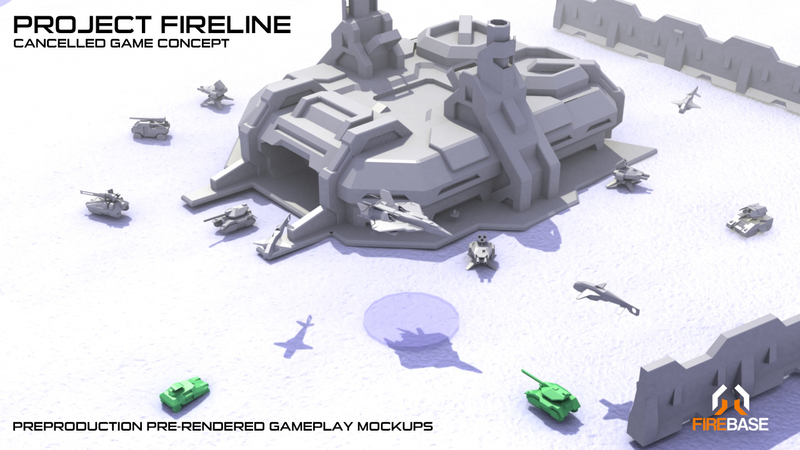 Units types could also be upgraded as in a game such as Halo Wars or Starcraft, by upgrading portions of your main base. This was accomplished by upgrades to the factory portions that internally build the land, and air units. Upgrading the air unit capability would also help your own jet for example. You could also increase general unit production speed. Terrain was going to play into the concept a bit more as the ground would have had a decent amount of undulation, in addition to the canyons and rivers of the original game. Your jet would simply travel at a fixed distance above the ground at all times so if the landscape became elevated you would just match the elevation as you flew around. Technologically this would have been accomplished by using the Sunburn Engine’s new height map rendering system. Instead of the pickup, order, drop, pickup, order, drop method in HZ, unit selection and orders could now be achieved in bulk via a Halo Wars style paintbrush, or entire screen selection method. In the screenshots you can see the blue indicator directly underneath your jet, this would have been able to expand to cover more units at once to accommodate this order method. To assist in moving troops around the map your jet would have been allowed to drop a single Waypoint Beacon. From anywhere on the map you could order forces to head toward the beacon thus adding a less linear movement order structure to the game that what the original version had. If you drop a second beacon it would have just replaced the original. Visually, we created a few new tricks with baked on lighting that would have really helped make the game look spectacular. 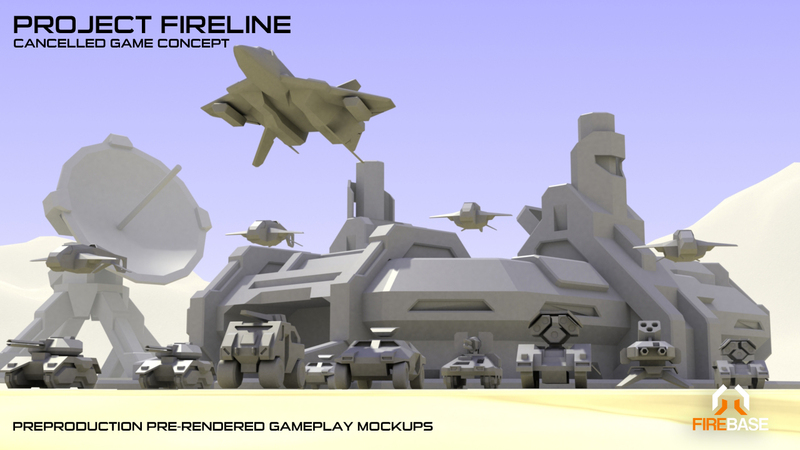 Each unit would have had a level specific texture on it depending on the environment so it would take on the bounce portion of the lighting. For example, if it were a desert sand level the light brown bounce would have been added into the texture. If it were snow it would have had the blueish one, etc. There were plans to include dynamic time of day as well as fog into the game. You could battle through the afternoon to sunset, through a short night, and back into the morning sun by leveraging the dynamic lighting in the engine. Vehicles would have had cool headlight effects so in the darkness of night they would have lit up the ground in front of them. There would have been all kinds of pretty effects, making Orbitron: Revolution look really basic in comparison. We would have loved to have worked on and completed the game but we didn’t really want to compete with another indie developer, Carbon Games, for the same audience. Their game was so far ahead of ours at the time that it seemed like it wouldn’t have been worth the resources to come out in their shadow. We are not averse to resurrecting the idea later but it isn’t a game that we think could be built indie style given the competition. Anyone interested in playing a Herzog Zwei like game we recommend you head over to Carbon Games and check out their take on the concept, Air Mech.